MOUNT ETNA started spewing ash and lava after creating a new fissure high up on its southeastern flank on December 24, 2018. In the wake of the Indonesian tsunami caused by an underwater landslide at Anak Krakatau; Etna made its own headlines today, when several tremors sent seismograph needles translating what is happening at the volcano. The Etna Observatory, part of Italy’s National institute of Geophysics and Volcanology (INGV) explained that it could “possibly be a result of magma moving through the crust”. Due to the activity taking place high up its flank; it didn’t pose a threat. However, Etna is being closely monitored. Catania Airport was closed to avoid planes getting caught in the ash at the time, but was later re-opened. Declared a UNESCO world heritage site June, 2013, Etna said to be the highest active volcano in Europe, and one of the largest and most active in the world; is reportedly moving towards the Sicilian sea at a rate of 14mm a year. In a previous interview (2010) with Salvatore Caffo – Chair Volcanologist of Etna Natural Park he gave me an exclusive glimpse into the many features of Mt Etna. Situated north-east of Sicily; Mt Etna is the largest European volcano covering over 1260 square kilometers. Being an active volcano – Etna is being monitored closely for any change in its general pattern. 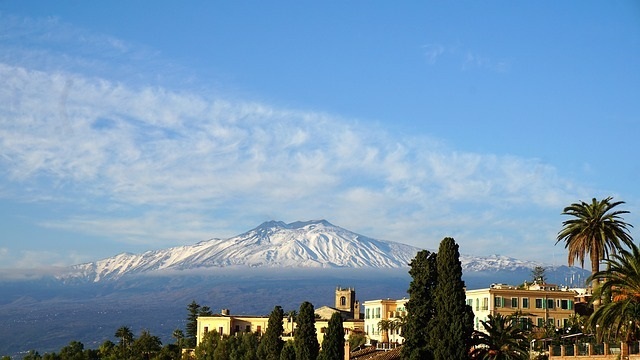 A popular tourist destination – Etna completes the beautiful Sicilian landscape hiding its true nature under lush green vegetation and a seemingly quiet slope. Just underneath is a hype of volcanic activity. Etna was born about 600 000 years ago when the African Lithosphere plate to the south collided with the European-Asian plate to the north. This caused fragmentation of the earth’s crust and created a mosaic of almost stable micro plates from which Etna arose to the south. Etna’s geologic make-up is unique to that of other volcanoes. How? The earliest reports of Etna was penned in a poem written by Publius Vergilius Maro about 100 BC. Moans through her shores, and smoke involves the sky.